Like most people, there are things in my childhood and adolescence that scarred me emotionally. Interactions with family members and friends stay with you a long time and those memories mark you in many ways. They also influence your decisions and ideas about who you are and how the world operates. I’m 44 now and it’s amazing how much I’m still unpicking those threads from my younger years. It’s like there are dozens of boxes strewn around the place and every now and then I trip over one and land unceremoniously on my backside. Of course I can choose to get up at that point, kick the box to one side and keep going. But invariably all that means is there will be an even harder fall in the future. The Universe is like that you know. It will flag an issue for you to look at and, if you choose to ignore it, it will simply smack you harder next time. The Universe’s subtlety and patience can sometimes decrease rather rapidly. These days I generally make time to undo the strings and sticky tape that’s holding the box together, and then I look inside. Some of the boxes in the past have been labeled with words like ‘rejection’, ‘need for acknowledgement’, ‘disrespect’, ‘judgement’, ‘abandonment’ and ‘love’. Inside each one has been a memory of how someone treated me, something said in jest or with cruel intention, or a situation that caused me pain. As I’ve peered into each box, I’ve understood that I too had a role to play in creating those moments in my life. There were lessons for me to learn and things I needed to know about myself and others. Does that mean the behaviour of some people was acceptable and kind? Definitely not. Sometimes it was the absolute opposite and, unsurprisingly, they are the moments that have marked me the most. But with self-awareness, I have to acknowledge that while those things happened, I cannot allow them to twist my present and future in unfavourable ways. 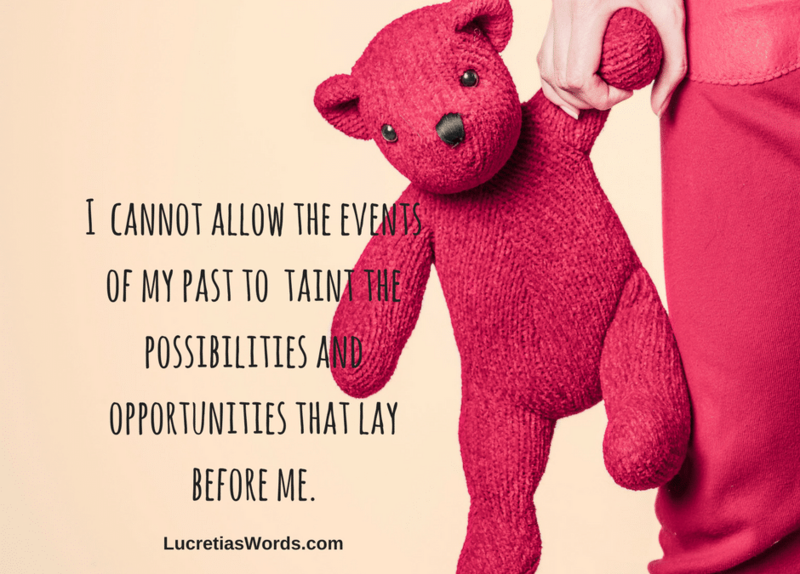 I cannot allow them to taint the possibilities and opportunities that lay before me. Yet sometimes that’s exactly what happens. Someone will say or do something in the present and I’ll be triggered back to that moment in my childhood or adolescence when something similar happened. And in that moment all the emotion from that past event will rise within me. Suddenly I will feel like I’m swimming through cotton wool, voiceless, powerless and with no idea where to go. This is the moment the Universe pushes me over a box from my past. It can be tempting to ignore the box and instead focus on the antagonising trigger in my present. Certainly it would feel more satisfying in the short-term to throw all my blame and pain on the person triggering my response. But I know there is a reason such strong feelings arise and usually they start with me, my past, my lessons and my path. So I instead I apply metaphorical iodine to my wounds and open the box to peer inside. Then I find a way to work through its contents, get help to process it all if I need to, and then I do my best to let it go. Unsurprisingly, it’s at this point the antagoniser in my present loses their power. I can deal with them calmly, almost matter-of-factly then, because it was never really about them personally. They were just a mirror showing me something to look at. They were just a chance for me to learn that now, as an adult, I can find another way. Lucretia Ackfield is a writer and transformational teacher who helps women reconnect to the greatness that lies within by accessing their intuitive power. If you’d like to learn more about using your intuition or Lucretia’s programs, check out her Facebook page Lucretia’s Words or join her Facebook group Rock Your Inner Channel.